Brahmagiri:15/12/18: Acting on the reports of the National Institute of High Security Animal Diseases in Bhopal confirming the outbreak of bird flu in Krushnaprasad block of Puri district, the district administration on Friday began culling of poultry in Maluda village. According to sources, a five-member team of Animal Resources Department began the culling process at a poultry farm in the village and dumped the dead birds in a pit dug on the outskirts of the village. As informed by the secretary, Fisheries and Animal Resources Department (F&ARD), Vishal Gagan on Thursday, the officials of the Animal Disease Research Institute (ADRI) at Phulanakhara in Cuttack had collected 500 excreta samples of dead crows, hens and ducks from Sanasahi, Maluda, Alanda and Patharaganja villages of Krushnaprasad block on December 9 and 10 for test of which 20 samples were sent to the National Institute of High Security Animal Diseases in Bhopal, where excreta samples of two crows and two hens tested positive for the avian influenza. 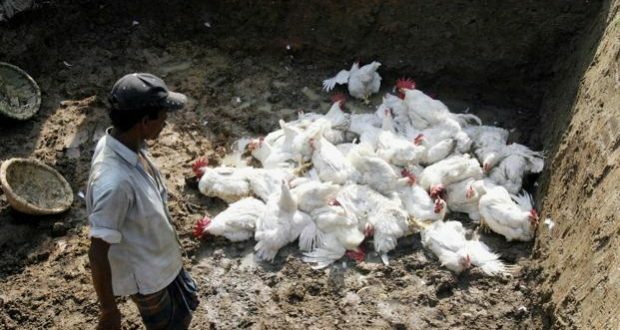 Chief District Veterinary Officer (CDVO) Dr Girija Patnaik had earlier said that the culling of poultry would begin in the four villages where the samples had tested positive. Besides, the culling will be extended to villages within a one-km radius of these affected villages.